PSI and GPM, what do they mean? What Makes Electric Pressure Washers Powerful? 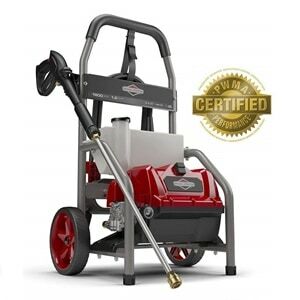 What Kind of Equipment Should You Expect with Your Powerful Electric Pressure Washer? What Can You Clean with them? 1. Are these pressure washers safe to use? 2. What kind of cleaning agent or detergent should I use with my electric pressure washer? 3. Can I let my electric pressure washer use hot/warm water? The demand for pressure washers is getting bigger by the day, and the variety is following a similar trend. These machines deliver strong and sustainable results, and technology became available worldwide. Now, if you want to get your hands on the most powerful electric pressure washer that fits your needs, you are going to have to dig a bit and do some research. Luckily, we have decided to grab some of the most popular units in this class, and give them a test run. We wanted to see what’s the fuss all about, and if powerful electric pressure washers are worth our time, and, we were pleasantly surprised. So, if you wish to arm yourself with the necessary knowledge, we’ve got you covered. Stay around, study our reviews and our buying guide, and learn how to make the best possible decision. Let’s dig right into it! Sun Joe is approved by the Canadian Standards Association and sports dual detergent tanks with a 0.9-liter capacity for each tank. It can produce up to 2030 PSI – a pressure output that determines the power of the washer. The larger the PSI, the better pressure washer, and 2030 PSI is an extremely powerful one. It has a 1.76 Gallon Per Minute (GPM) flow rate. Also, it uses smart technology to shut off the pump when not in use. Furthermore, it features five different spray-connect tips for different purposes. This is one of the most powerful pressure washers on our list. It offers a 35-foot power cord and the maximum water inlet temperature is 104F. A 20-foot high-pressure hose is also included with the product. The smart mechanisms help prolong the life of the product but in case yours gets damaged, Sun Joe provides a full 2-year warranty. The length of the pressure hose helps with those hard-to-reach places and the rear wheels provide easy portability. This is generally an averagely priced product which offers the best features in this price range. It also saves water and energy. This Homself electric pressure washer aims to be powerful and portable at the same time. The total weight of the washer and all its components is just under 25 pounds, which is great if you plan to maneuver around the yard a lot. The unit is mounted on a 2-wheel system, and it has a foldable heavy-duty handle for carrying and/or wheeling around. The motor of this unit can exert 3000 PSI at 2.4 GPM, enabling it to tackle any task you put in front of it. Onboard, there is an automatic total stop system installed, which will make the pump shut off if the trigger is not pushed. This installed feature will increase resourcefulness and safety and will prolong the life of the unit as well. 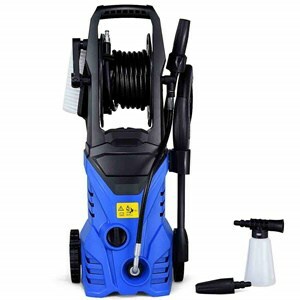 This particular electric pressure washer comes together with 33-foot-long electric cord, 40-foot-long high-pressure hose, a spray gun, 4 interchangeable spray nozzles (0-degree, 15-degree, 25-degree and 40-degree), and a small assembly toolset. The unit has an excellent power-to-portability ratio. You can get around the yard easily and tackle any cleaning job. The manufacturer included an assembly kit, which means that you do not need any kind of additional tools to start cleaning. The automatic total stop system is quite responsive and fast. The washer doesn’t come with a soap nozzle. You can only clean in time increments of 15 minutes in continuity. 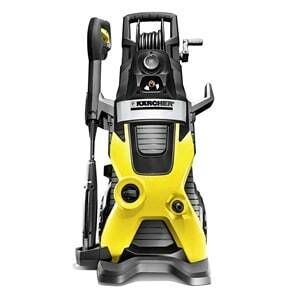 Kercher is a renown manufacturer of all kinds of tools, and the K5 electric pressure washer is a well-made model for any type of task. It is designed to look modern – it’s almost futuristic with its black and yellow parts. The body is vertical and it is mounted on a 2-wheel system, with front legs that add more stability. Total weight of this machine is 32 pounds. K5 has a motor that produces 2000 PSI at 2.4 GPM, which enables the washer to approach any kind of cleaning task. The wand has a Vario Power spray mode, which gives you the option to adjust the spraying while you clean. The pump itself is made of highly durable materials, and the motor is water cooled, which makes longer cleaning sessions possible. Inside the package, besides the pressure washer, you will find a 25-foot long high-pressure hose, a Vario Power spray wand and a Dirt Blaster wand. The model comes with two different spray wands that help you adapt the washer to a wide variety of tasks. On top of the washer’s body, there’s a hose reel that makes storing and moving much easier. This model has a large onboard detergent tank for long cleaning sessions. Moving is slightly irritable due to the unit’s vertical design, but it is caused due to the safety legs on front. There is no additional spray nozzle set, although there are two different adjustable wands included. This Sun Joe pressure washer is quite popular among yard decorators, and the SPX4000 is bringing a lot to the table. The body is designed to be stationary, however, it does have a vertical frame and a 2-wheel system to help you move it by tilting. A heavy-duty handle on top is acting as the vertical part of the frame, which makes the unit similar to portable pressure washers. The motor on this Sun Joe is capable of exerting 2030 PSI at 1.76 GPM. This qualifies it as a pressure washer for all sorts of purposes. Additionally, this washer can work within two selectable modes, a low 1450 PSI, and a HIGH 2030 PSI, allowing you to adjust it to your current needs, thus saving water, detergent and time. Along with the pressure washer, there is a 20-foot-long high-pressure hose, and 5 quick-connect changeable spray nozzle tips (0-degree, 15-degree, 25-degree and 40-degree and soap). 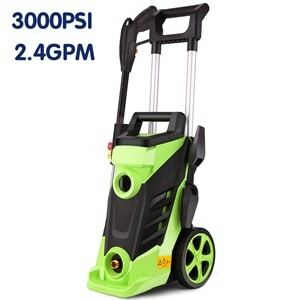 The body and frame of this electric pressure washer are designed ergonomically. You can even wind the hose around the main frame for easier storing. The nozzle set covers every type of situation with 5 quick-connect nozzles. This model’s motor is designed to save power if you are working on an easier task. The detergent tank is smaller than the models from the same class. The wheels form the 2-wheel system could be bigger, but the portability is still there. Among the major competitors, Briggs & Stratton found its place with their well-made electric pressure washers. This particular model is designed to be both stationary and portable with its wide body and a 2-wheel system. On top, there’s a heavy-duty handle if you prefer carrying the washer around the yard, which is possible due to its total size of only 26 pounds. The motor of this pressure washer model can operate in several modes, with 900 PSI minimum and 1800 PSI maximum pressure, exerting at 1.2 GPM. Yards, cars, garages, patios and a whole lot more are within reach when it comes to cleaning with this pressure washing unit. Inside the package, you will also find a 20-foot long flexible high-pressure hose, and a set of 3 quick-connect spray nozzles, including a turbo nozzle for extra stubborn stains. The body of this pressure washer is made of welded steel, thus increasing its durability and stability. Provided turbo nozzle works excellent in focusing the stream during hard cleaning jobs. On top, there is a large 1/2-gallon detergent tank, which is larger than the ones from average models in this class. You will need to make short pauses every 15 minutes in order to not overheat the motor. The unit is a bit heftier, so storing will require a bit more additional space. 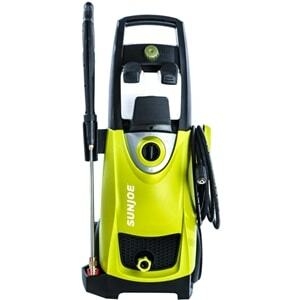 The GoPlus is one of the lighter models in the powerful electric pressure washer group. However, do not be fooled by its size and weight (only 19 pounds), because it still delivers powerful performance. This model is designed to stand upright, but it still has a 2-wheel system on the back for easier transporting. Despite the size of the washer, it’s electric motor exerts 2030 PSI at 1.6 GPM, making this unit as versatile as the others from its class, but way easier to carry around. The motor doesn’t have additional settings, and the operation is narrowed down to a simple ON/OFF button. On top, there is a hose reel, which makes the washer extremely convenient to store and transport. Along with the washer, inside the package, you will also find a 16.5-foot long high-pressure hose, a spray gun with a fixed brush, and a soap bottle which acts as a tank. 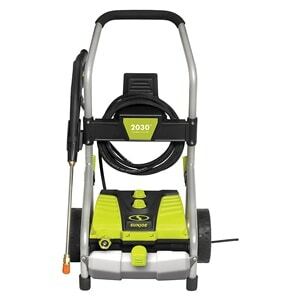 Among powerful electric pressure washers, this model is one of the most portable ones. This unit is pretty affordable, considering what it brings to the table. The pressure washer is simple to operate and is considered plug-and-play by many users. Lack of power settings makes the unit always work on full blast, which makes saving water and energy impossible. The unit has a small detergent bottle that will need a refill every once in a while. As you have probably concluded already, there are so many choices when it comes to the powerful electric pressure washers. Every model has something slightly unique, or it has a distinctive combination of standard features, so getting to know what these features are is of the utmost importance. In the sections that follow, we are going to talk about the intricate details, and everything worth your attention regarding these powerful electric machines. As seen above, every model has a PSI and a GPM rating. In short, PSI and GPM represent pound per square inch and gallons per minute respectively. Both specifications are equally important, with the first one describing the raw power of the pressure washer, while GPM qualifies the amount of water needed to support that much pressure. Now, not everyone is an engineer, and knowing exact units and quantifiable data should not get in your way. The math is quite simple, with a single principle: the bigger the number, the more powerful a pressure washer is. However, keep in mind that a higher PSI and GPM stats require more electricity and more water/detergent. So, if you intend to use your pressure washer for easier tasks and light cleaning, consider getting a model with adjustable power settings. There is an easier way to get around the numbers and decide how powerful a pressure washer is. It is called CP, or cleaning power. This refers to the total power a machine can exert, and to get that number, all you need to do is multiply PSI and GPM. It’s that easy. Simply mentioning PSI, GPM or CP just won’t cut it, because those numbers do not exactly have use outside of this context, and the frame of reference is not that easy to understand. Getting the highest number is important, yes, but there’s more to it than just pointing at digits. The first power element of an electric pressure washer is its motor, of course. Motors are there to power the water pump and make the whole liquid circulation system going. Additionally, electric motors are known for being compact and lightweight, which is always a plus when we talk about the machines that you need to haul all over the yard. But what really makes an electric pressure washer powerful is the engineering – specifically the way its power is utilized. Just having an ultra-high PSI washer can be futile if the water flow is not used in the best possible way. That’s where every washer model tends to differentiate. There are many factors that can affect the end results of cleaning potential, besides raw power. Spray gun quality, power adjustment, pressure hose type. These are just some examples of what really makes these electric pressure washers better or worse, depending on your requirements. But of course, if you want the maximum power, you should consider having a look at gas pressure washers. While there is a live debate considering the ecological factors around every type of pressure washer out there, electric ones have some guaranteed advantages. No matter the size and power ratings of an electric motor, chances are that you will not have to do a thing when it comes to maintaining their insides. These motors are tightly packed and oil-free, so no greasing is involved. With certain models, and only when the manufacturer stresses it out, you will have to make short breaks during your cleaning so that the motor can cool off a bit. If making pauses bothers you, consider getting a pressure washer model that has water cooling. These models are known for prolonged work hours simply due to the fact that they use the water that circulates through the washer as a cooling agent. Another important factor that people tend to forget about is the noise levels. Yes, you will be washing outdoor surfaces, but no one likes wearing earplugs. Generally speaking, electric motors are known to be quiet, except when you crank the PSI power to max when tackling stubborn stains. Again, if high noise levels bother you, an electric pressure washer with adjustable settings might be the safest bet. When we said that there are some great engineering solutions included in making these powerful electric pressure washers, the first thing that came to mind is the size of these models. They are compact and portable, not weighing a lot, yet they can challenge any stain you need to clean. Hose reel – a big wheel on top of the unit’s body that helps you keep the high-pressure hose in an ideal position when not in use. It keeps the hose from tangling and choking at the same time, which is extremely important because of the pressure pressing the insides of the hose. Units with hose reels aren’t prone to hose kinks like models that don’t have it. A 2-wheel system – almost every electric model out there has some sort of a 2-wheel system. Some have big wheels, designed to go up the stairs if necessary, some have small wheels that are there for level surfaces. Either way, you will not have a problem moving it around the yard or driveway. Heavy-duty, lightweight body – One of the most important features, besides the motor itself, is the body that holds everything together. More compact pressure washer models have only the main support rail made of steel. However, it is not a rare sight to see an electric pressure washer with a welded steel frame. They have just enough to make the model solid and not a lot to make it too heavy. There are many ways to utilize the full potential of a powerful electric pressure washer unit. The best way to harness the power that these machines offer is through the equipment they have onboard or added on the side. You have surely noticed that not a single pressure washer comes without equipment and that they always have a list of items included in the package. So, let’s see what kind of equipment you should aim for. The bread and butter of every well-made pressure washer is the hose that’s transferring the pressure from the water pump to the spraying wand. According to some professional tool users, the quality of the hose is as important as the power rating of the pressure washer. The explanation behind this bold statement is that no matter the PSI and GPM that the motor produces if the hose can’s handle it, it is all in vain. High-pressure hoses that accompany the pressure washers are made in several layers. Often, they will have some sort of wire network inside that will help in keeping it resistant to kinks. Additional layers of synthetic materials are there to prevent corrosion and damages. When it comes to the length of the high-pressure hose, the longer the better doesn’t apply in every case. Longer hoses are more convenient, but the longer the hose is, the higher the power setting needs to be. After all, pressurized water needs to travel a larger distance without losing pressure. That’s why the optimal length of the high-pressure hose should be kept between 15 and 25 feet. At the end of each hose, there’s an outlet system, often in the form of a spray wand. In its core, a spray wand is a hollow tube that needs to be attached to the high-pressure hose in a perfect fit. The majority of spray wand models have something called a trigger or a pressure lever on the bottom side. It is always placed conveniently under your palm, so you can control the flow of pressurized water. Standard practice is to have a twisting valve on the wand that controls the angle and the width of the water stream, thus controlling the cleaning power directly. For this reason, some models include different detachable wands, with some kind of turbo wand for maximum pressure and minimal angles. However, having a single wand with interchangeable nozzle tips are becoming more and more popular with each new model, which brings us to our next equipment-related topic. Soap nozzle – it is the nozzle with the least cleaning power, simply because it has a different task. This nozzle has the job of spreading the detergent from the detergent tank as widely as possible, with little to no loss. It is used when you need to soak stubborn stains in soap so that you can eliminate them. 0-degree nozzle – this is the mightiest attachment of all. It focuses the water stream into a single line, utilizing the full force of a powerful electric pressure washer. 15-degree nozzle – if you need both power and cleaning speed, a nozzle this wide is best used with concrete and metal surfaces. 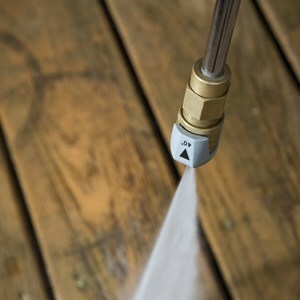 If the pressure washer is on a high setting, by using this nozzle you risk damaging softer materials like wood. 25-degree nozzle – it is the most versatile out of all nozzles from the standard set. It can provide a lot of power, with a spread wide enough not to damage contact surface. 40-degree nozzle – often not a part of the provided set, a nozzle this wide is used when you need to cover a lot of area in a short amount of time. Just keep in mind that it cannot provide the full blast, no matter the power ratings of the pressure washer. Learning when and how to use each nozzle will allow you to unlock the full potential of the pressure washer models out there. A topic that deserves a special mention is power management. This includes every model that has some form of PSI control at the motor side, and not at the end of the spray wand. 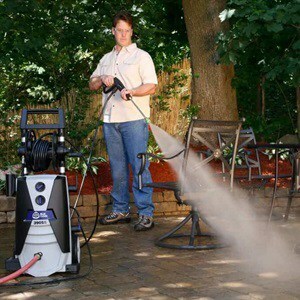 These electric pressure washers are powerful, and the last thing you want is to damage a good piece of patio furniture or the wood finish on your porch. Controlling the power output can be useful in more than one way. It is certain that you will not need the full power turned on all the time, and the best things about controlling the PSI are electricity and water saving. Once you get the hang of it, you will know when to bump up the power and when to go low. All it takes is a little practice. If absolute control is what you’re after, then we recommend getting a model that has power regulation both at the motor side and at the spray wand side. By utilizing each feature at the same time, you can finely tune the stream of pressurized water, and avoid any material damages and/or unnecessary waste of resources. We have talked about all the mechanisms and systems that make these garden machines great. But now it is time to talk about results. Let’s start from the lightest material and build our way up. Porches, decks, outdoor tables, and chairs, you name it. With a wide enough spraying angle, you can tackle wooded surfaces and get them cleaned in mater of minutes. Consider the softness of wood before you engage it with your pressure washer, because you may damage it. For softer woods or boards with little or no protective layers, either use a wide-angle nozzle/spray wand or set your pressure washer to a low power setting. And in the case of hardwood or heavily-protected wooden surfaces, feel free to kick it up a notch and use a 15-degree nozzle. The best thing is that now you will be able to clean that nasty gunk that has gathered between the boards for ages. If you are not sure how to approach and adjust the power setting/angle, try cleaning a small part on the side, and see what happens. A few square inches should do the job. One of the best uses for a powerful electric pressure washer is none other than cleaning inside and around the pool. Getting between the tiles and cleaning the nasty grime that accumulated during the season is extremely satisfying, and incredibly hygienic. Test the impact on a single tile before you start. By mineral surfaces, we mean any kind of stone or marble object. As a part of our yard/patio furniture, mineral surfaces tend to get moldy, as they are essentially stone – a natural habitat for mold and lichen. So put your pressure washer on a wider setting and get rid of it in a matter of seconds. Lastly, the highest settings and the narrowest nozzles are made for surfaces that are endurable and get dirtier than the rest of the yard. Driveways, rain drainage, garage doors, etc. Everything is fair game as long as you test out on a smaller bit. The risks of damaging these surfaces are minimal, so get ready for some longer pressure washing sessions. After standard targets, we should mention some rarely thought of surfaces that you can clean with the high psi electric pressure washers: washing outside facing windows, cleaning gutters, restoring old and greasy grills, paint removing, etc. You get the idea. All you have to do is try and experiment a little. Even though it is not addressed a lot, wearing protective gear is not uncommon while operating a powerful pressure washer, especially if you use narrow-angle nozzles. The ideal scenario would be to wear at least some protective eye-wear, just in case. And if you want to make sure you’re safe, some hard-industrial boots would be great, because if an injury occurs, it is most likely going to be something related to the feet and slippery, soapy surfaces. Do not forget that these machines are really powerful, and do not underestimate them just because it’s the water they spray. Well, the short answer is: it depends. The safest bet would be to check with the manufacturer of the model you are interested in and see if they have their own brand of cleaning detergent. This way you will know for sure that it works. However, being that these cleaning agents do not differ that much, you can mix it up a little. If you are not sure, check with a smaller amount and see how the pressure washer reacts. Just make sure that you are using the correct soap nozzle while you are applying the soap. Some models allow it, and some don’t, so feel free to check the manual. However, even though hot water sounds like a logical choice for better cleaning performance, it will not yield any significantly better results. Using hot water is only good in certain cases of really stubborn stains made by grease or oil. The pressure exerted by these machines is powerful enough to tackle anything else, regardless of water temperature. So, there you have it. All you need to know about the most powerful electric pressure washer machines. They deliver a lot and are not to be messed with. Do not mistake them for a toy, but feel free to experiment and see the versatility for yourself. We think that in order to really get the best washer for your yard, you need to arm yourself with knowledge, which we provided in this guide and these reviews. After all, the more you know, the sooner you get to wash away all those nasty stains on your driveway and patio furniture. The feeling of using a powerful electric pressure washing unit is priceless, fun and interactive. If there’s something you wanted to ask, or have a comment to add, please feel free to do so in the comment section below, and Pressure Washer Lab will be glad to answer as soon as possible.